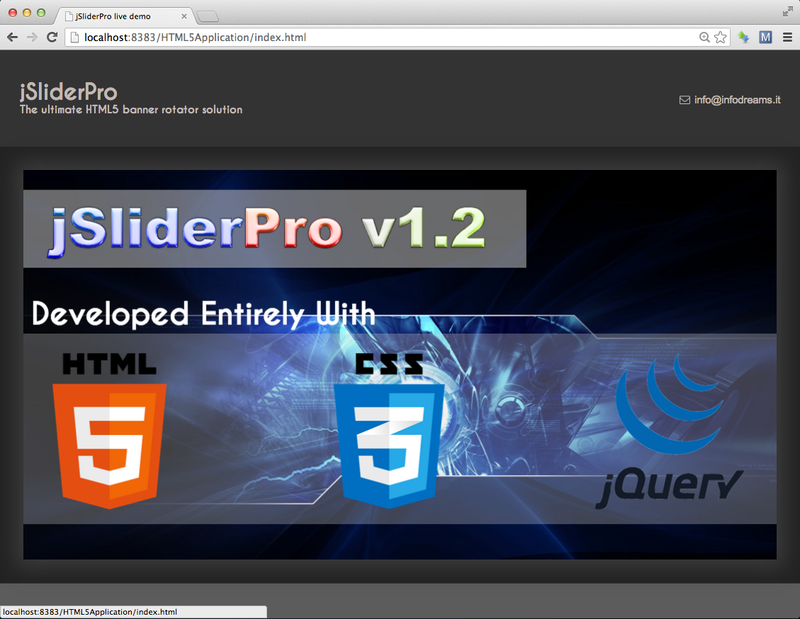 jSliderPro is a complete and highly customizable jQuery slider and banner rotator and is equipped with a complex set of features that make it extremely flexible and adaptable. With little effort you can create unique, fully responsive and animatable HTML5 banners, image slideshows and presentations with texts for your websites. The the central strength of jSliderPro, lies in its ability to offer thousands of totally different and stunning animations. In fact, unlike other similar components that implement a limited set of atomic transitions, jSliderPro separates some basic concepts. In this way the user can mix them together in countless ways, limited only to him/her imagination. Such animations can be applied to background images and HTML overlays. To equip your website with advanced and highly effective banner rotators. To create your powerful and eye-catching presentations. To create photo slideshows of your galleries. To enrich your ads viewer. Exciting improvements to the HTML overlay sistem. Dedicated website with extensive documentation, discussed examples, forums and more. jQuery based animation engine, for background images, that can generate an incredible number of stunning effects, about 100K and more. You can customize a lot of aspects of animations such as the tile grid size, in rows and columns, and the graphic effects to apply them. You can also mix alla available effects togheter, set their speed and placement in time. Animation engine for overlays with the same possibilities offered for background images. 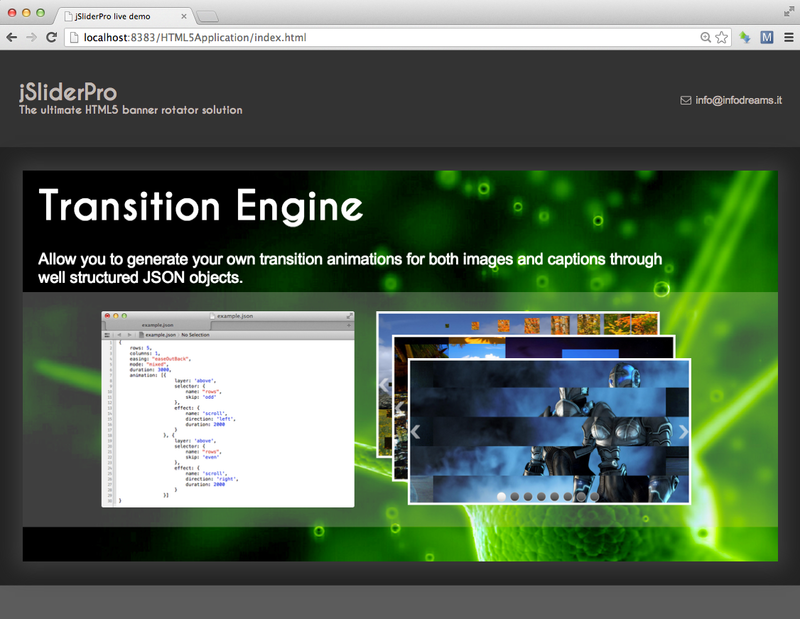 jSliderPro adds now a new layer, which can be composed by HTML elements. You can not only add captions to your slides, but also, images, lists, videos, hyperlinks and so on. But that’s not all, everything can be animated in a number of ways that is limited only by your imagination. Fully customizable Buttons and Bullets with 400+ position’s configurations. 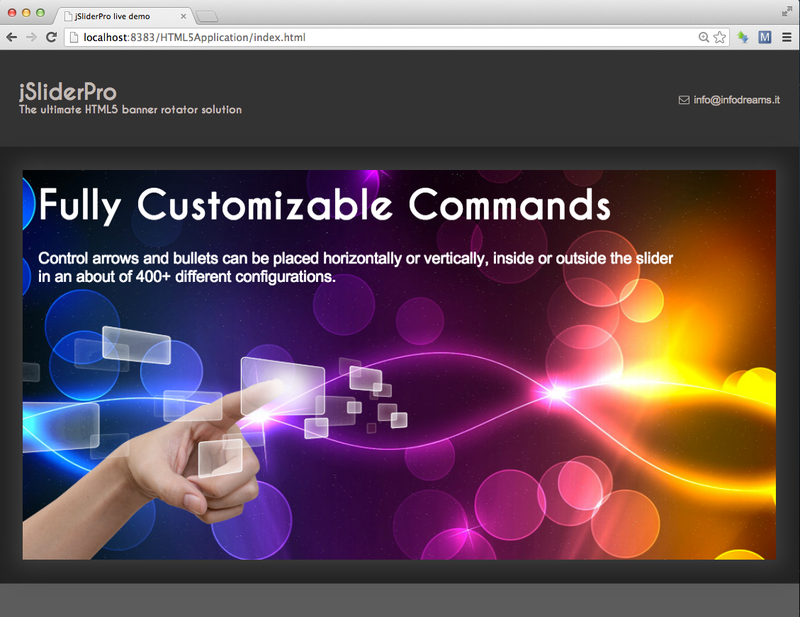 jSliderPro gives the option to set an image for navigation buttons and bullets. It’s possible to place them in every possible arrangement (horizontally or vertically, on the corners and even externally) and smoothly trim their position. Optionally it is possible to make them appear only when the user points inside the slider area. No images number limit and automatic memory management. Don’t care about the number of slides you need to have, jSliderPro loads/discards images only when needed (even if you specify them as <img>). On-the-fly image resize and clip. No need to prepare images with Photoshop, GIMP or other similar software. You can adapt size and crop via simple parameters settings. 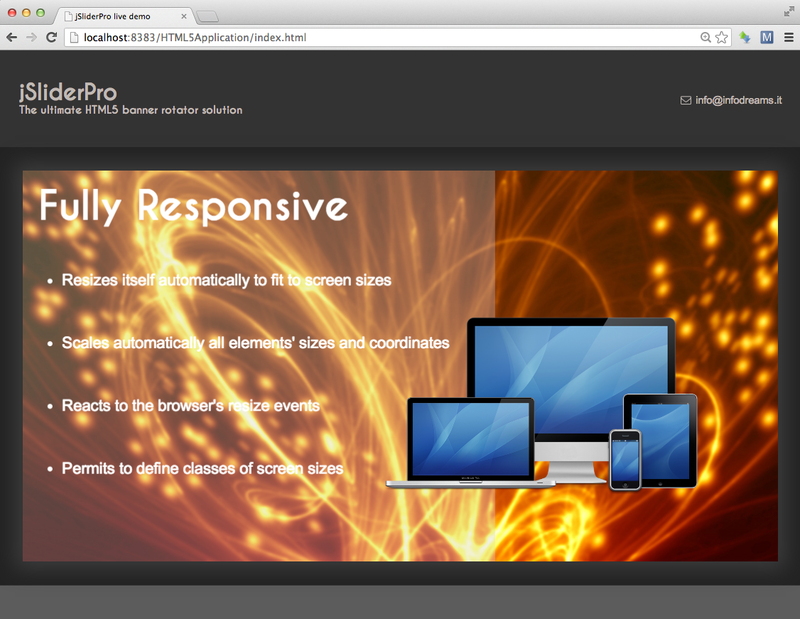 Fully responsive and cross browser compatibility from desktop PCs to mobile devices. The slider can automatically scale down to mobile devices adapting buttons, bullets images and also their positions. Touch enabled: swipe left or right to change slide. Mobile users can use gestures for navigation instead of tapping on buttons. It’s possible to choose if transitions will be happen in a continuous timer-driven fashion, only by commands (arrows and bullets), or pause when mouse points inside the slider area. Easy to interact through javscript code using callback mechanism to respond to several events, such as user interaction, animations finish and so on. Could use standard HTML tags or <div> to specify contents. This makes your images, texts and other elements fully indexable by search engines. Two operative modes: fixed and responsive. 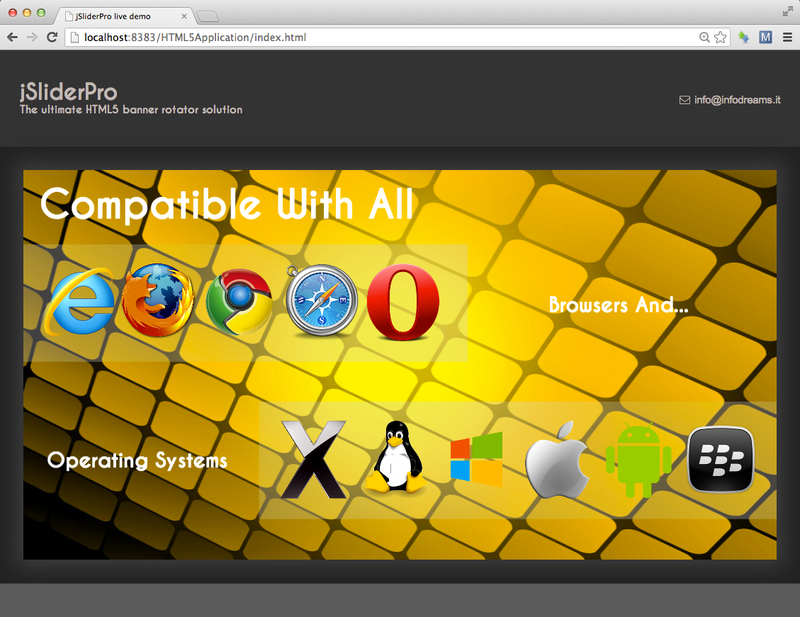 jQuery, CSS3 and HTML5 only. Reference manual and hundreds of ready-to-use examples included in the provided package. Added support for multiple HTML overlays. Added support for different slide modes: continuous, pause on hover and by commands. Added option to show/hide commands on mouse hover/out. Added cursor pointer change on hover to commands. Improved images animations through the use of canvas. No more freezes before transitions and quicker commands’ response. Improved the resizing system to avoid the stop of animations when the slider changes its size. Removed methods getRows and getColumns. Added support for swipes on mobile devices. Resolved a bug with the Zoom effect. Resolved a bug which manifested itself on ‘columns’ selector. Resolved an issue with jQuery that hampered transitions’ selection. Resolved a little problem happening after the resize event. Resolved an incompatibility with Internet Explorer.